Thomas and Emerson's parents died years ago when she was young. Thomas, her much older brother, was appointed her legal guardian, and he and his wife have raised her since. Emerson sees dead people. Or at least she thinks she does, until Michael enters her life and explains that what she's really seeing is just an indicator of her special ability. Michael was hired by Emerson's older brother Thomas to help Em with her "problem" where years of specialists and medications have failed. Emerson learns she's not the freak she always thought she was, but is actually a part of a community she didn't know existed. While Michael and Emerson have an undeniable attraction, Michael tries his best to keep things professional. It doesn't take Em long to figure out that Michael isn't being entirely truthful about his intentions and as these things come to light, she realizes he needs her ability for his own agenda. She has to decide if she trusts Michael enough to help him. If she chooses to help, the risks are high and they both might not survive it. I read this book in a day and 1/2. I would've read it faster, but I had to take breaks from ignoring my family. Pesky kids kept needing to be fed. In addition to this being one of the coolest book covers I've seen, I absolutely loved this book itself. I fell in love with not only the main characters but also the minor ones as well. The author was merciful enough to not leave us on a cliffhanger at the end of the book, but I desperately hope she has a sequel in the works because I want more, more, MORE of these characters! It has been days since I finished reading it, but I can't bring myself to start another book yet because I want to keep reliving this story in my mind. If you only read a few books a year, let this be one of them. You will thank me later. 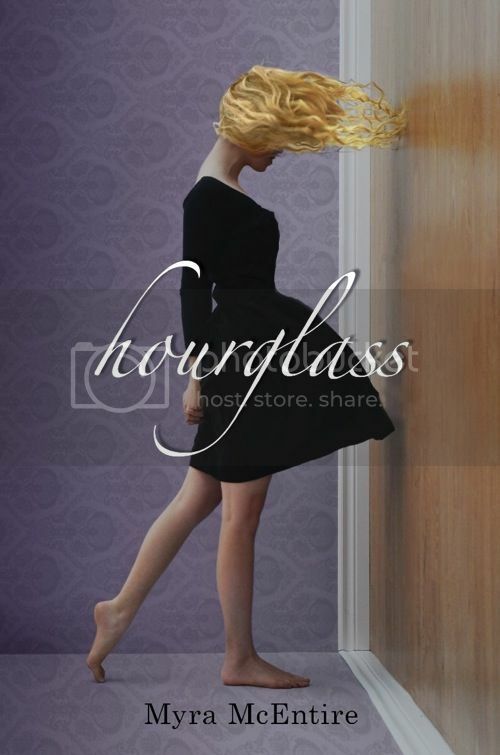 "Hourglass" by Myra McEntire is scheduled for release June 14, 2011 and is available for pre-order.